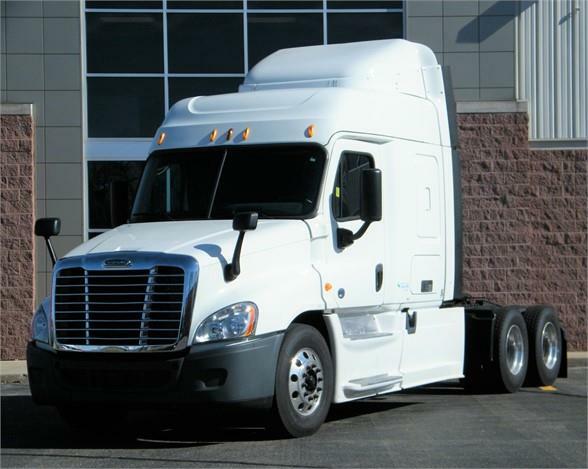 2014 Cascadia DD 450Hp engine, 10 speed Eaton, dual 80 gallon fuel tanks, air slide fifth wheel, NEW VIRGIN RUBBER ALL AROUND and excellent brakes. Very nice truck and is a MUST see and drive. Light weight is perfect for flat bedders, tankers or regional haulers or would make an excellent farm truck. We will include a FACTORY 60 day Buyers Assurance Policy on the Air Compressor, AC, Alternator, Brake Drums, Clutch, DPF, EGR valve & Cooler, Fan Clutch and Hub, Starter, Turbo, Radiator and much more plus a FREE FACTORY 1yr/100k mile warranty on the engine, transmission and rear diffs..NO ONE else in town can offer you all of this at such a competitive price period!!!!!!!!! !